Boneless skinless chicken breast can be so boring sometimes! Yesterday morning I had taken two frozen breast halves out to thaw and thought all day about how I was going to prepare them; I ran the gamut from simple and uncomplicated to full blown kitchen chemistry lab. By the time I left work I had in my mind visited Italy, Spain, and the South of France, stopped off in Ireland for a while and even hung out in Mexico and the Deep South! When I finally got to the grocery store I was feeling totally uninspired so I picked up salad ingredients and a bottle of Pinot Grigio and headed home. I figured I would cook the chicken simply, using whatever I could dig up in the pantry. Then as I dug around I began to form an idea; I had zucchini that needed to be used, pasta, a giant jar of capers, Spanish olives, a can tomatoes and bingo that was it…We were going to the Mediterranean! Drawing on fond memories of Snapper Veracruz and Pasta Puttanesca recipes I had prepared in the past I landed somewhere between simple and a science experiment. I cooked the chicken separately from the sauce because oftentimes when chicken is cooked in a liquid, it produces an unappealing protein scum (for lack of a better description). This also allowed for a good browning of the meat, assisted by a little tomato paste, that really added a richness to the final product. The anchovy paste and the final tablespoon of capers also boosted the flavor of the sauce. Note: If it seems your sauté pan is not large enough to hold everything use a large bowl to fold together, the sauce and the pasta. In a large sauté pan over med heat warm 4 Tbsp. of olive oil until shimmering. Add 2 cloves minced garlic, anchovy paste and about ¼ Tbsp. of ground Italian seasonings to the pan and sauté 1 minute, stirring. Stir in onions and celery and cook stirring occasionally until the onions begin to turn translucent. Stir in the carrots, rosemary, and oregano, and cook 5 minutes more, stirring occasionally. Add the wine and allow it to come to a boil, scraping up any browned bits that have stuck to the pan. Add the tomatoes, carefully crushing them as you add them to the pan. Add the capers and olives and allow the sauce to come to a boil once again. Reduce the heat to a steady simmer and cook 30 minutes. Stir in balsamic vinegar and continue simmering. Meanwhile warm 1 Tbsp of olive oil in a large non-stick pan over high heat. When oil is shimmering, add 1 clove of garlic and stir briskly, 30 seconds. Stir in chicken and cook stirring for 1 minute then add the tomato paste. Continue cooking, stirring often until the chicken has browned and just cooked through. Add the cooked chicken, zucchini, and chicken stock to the sauce and continue simmering until the zucchini is just cooked through. Season to taste with fresh ground black pepper and remove and discard the rosemary sprig. While sauce is simmering, bring a large pot of salted water to a boil, add pasta and cook per package instructions. When the pasta is cooked to your liking, drain (do not rinse!) in a colander and fold the pasta, along with the reserved tablespoon of capers, into the sauce. Serve garnished with shaved parmesan. 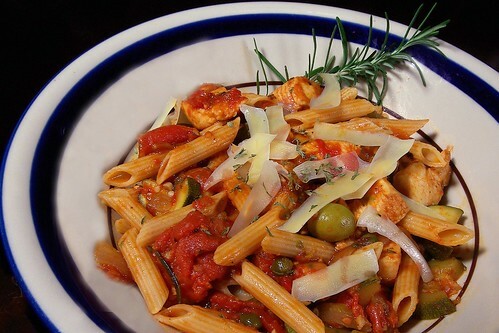 This entry was posted in Entree, Pasta, Poultry and tagged Balsamic, capers, Chicken, Garlic, grinder, Italian, mccormicks, mediterranean, olives, pasta, penne, recipe, Recipes, rosemary, Seasoning, vinegar. Bookmark the permalink. Made this last night. Winner, winner, chicken dinner! I’ll definitely be making this one again.